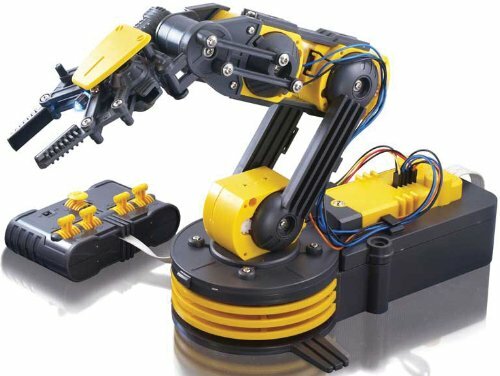 It accepts a wide variety of commands, and can you open and close the robotic grippers, and move the arm in a wide range of movements. It boasts a radial wrist motion of 120°, an elbow range of motion of 300°, a base rotation of 270° and base motion of 180°. I was pretty excited when I decided to order the OWI Robotic Arm Edge for my next review at the Robot Stockpile. Finally, I would have a robot arm to help with my many, many evils plots. Oh wait – it’s an educational tool? Ok – well, that should still be fun. After the OWI Robotic Arm Edge arrived from Amazon, and it was liberated from its box through a controlled demolition, it was time to take stock of the toy. I will have to say that I was immediately struck by the quality of the toy. Where many of the toys that have come across my desk lately have been constructed of the cheapest parts the company could find, you could tell that this toy was really made of high end parts. I decided to tackle assembling it right away, and even with my somewhat limited handyman skills I still had it assembled in a few hours. Most of the fun is in the assembling it anyways, so expect it to take a a long to assemble with a child. It does take some precise skills when assembling, and some of the plastic needs to be cleaned up before it is used. So don’t plan on just giving this to your child and heading off to watch sportsnet. Any child assembling this will need supervision and a fair bit of help with the more difficult aspects. Once the OWI Robotic Arm Edge was fully assembled and operational, it was time to put it through some rigorous testing that in no way resembled play. The range of motion on this toy robot is very good, and it can even pick up relatively heavy objects (for its size). It’s really too bad that they don’t offer kits to allow it to become mobile, since it would be a lot of fun in conjunction with something along the lines of an RC car. The OWI Robotic Arm Edge is an excellent quality toy that I would definitely recommend. With that being said, it’s not a toy that you should leave a child to assemble on their own, so only purchase this if you’re willing to put in the time with your kid. Click here to read more reviews at Amazon.com . For our Canadian readers, you can find the OWI Robotic Arm Edge at Amazon.ca.